Reflecting on the my recent half marathon has brought out my competitive spirit. As I mentioned, I didn’t meet my time goal. I was initially bummed when I finished, and I quickly got over it. However, even though they’ve been surrounded by positive thoughts, I’ve had moments of doubt over the course of the last couple weeks, and moments where I’ve been frustratedly wishing I was at the fitness level that other people are at. Thankfully, I’ve been reminded by my dear husband that there has been so much to be positive about. I finished, first of all, and I finished without injury. My asthma barely flared up this training cycle. The same thing could not be said for the first half marathon I trained for last year, which is a sign of improvement. Combined with the fact that I genuinely didn’t have time to train like I wanted to, I’ve resolved that it’s okay for life to get in the way sometimes – I’m only human. Plus, there are lots of other races coming up. Again, for the most part, I’ve felt pretty good about how everything shook out. I am writing this because I find it fascinating how, even when we aren’t competing with anyone else, we find ways to compete with ourselves. This isn’t intrinsically negative, but when we let this rule our lives, it can be destructive. We are our own worst enemies. Since I needed to be reminded of these truths, I wanted to share them with you, in case you need the encouragement as well. 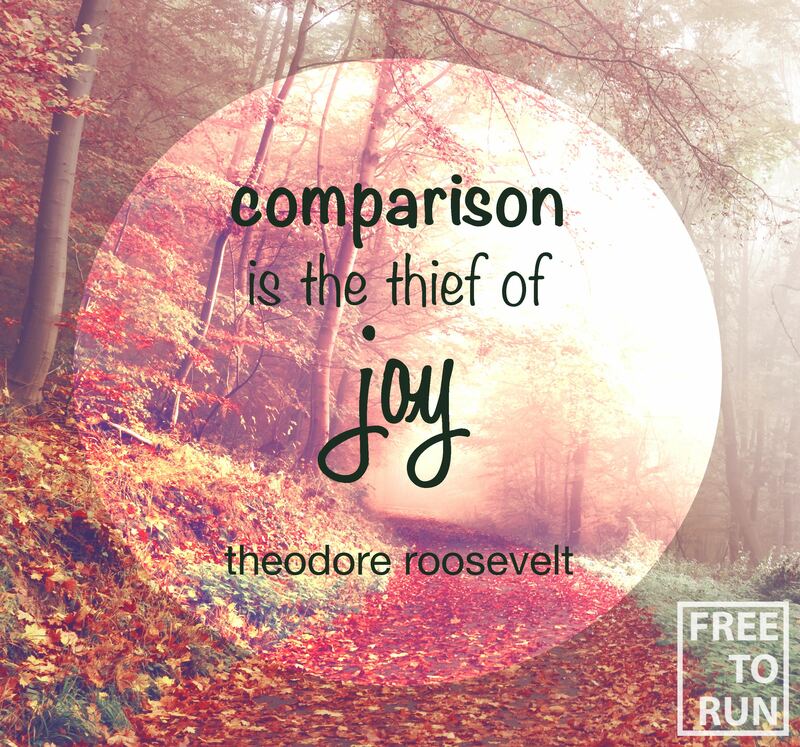 First, comparison will steal your joy, if you let it (so don’t!). There is always going to be someone faster in running that you can compare yourself to. With the endless parallels running brings to life, there is always going to be someone smarter, cooler, or whatever than you, so comparison is futile and will only cause you to focus on the negative. Comparison is not healthy! Regardless, if you’re giving your best effort (and even on the off days when you aren’t), your life matters, and there is always something to be thankful for. Second, accountability can remind you of the truth when you aren’t able to see it. We all fall prey to negativity, which is why accountability is a healthy alternative to comparison. My husband and friends who don’t run remind me that everything in life is relative, and they build me up when I struggle to remember how far I have come. Most of my friends don’t run, and when I tell them my running struggles, I’m also reminded how trivial they can be. The lessons I’ve learned from running are greater and far more important than a time on a piece of paper. Finally, whatever fitness struggle you are encountering, I implore you to remember that you are more than just a number on a scale, clock, etc. Comparing your success now to any success in different circumstances (someone else’s success, past progress, or something else), is fruitless. Yes, great things happen when you push yourself, but today is new, which means the present challenges are also different, and comparing other experiences under different circumstances is like comparing apples and oranges. Revel in the successes each day brings and cling to those. So, onward we go. Cheers to seeing the beauty in each day!